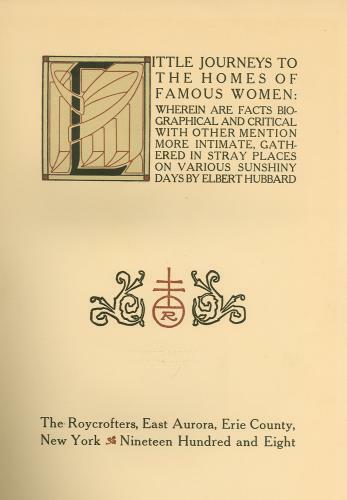 The Roycroft Collection at Luther College consists of twelve books which were written by Elbert Hubbard and/or designed and published by the Roycrofters Press at the Roycroft Shops in the village of East Aurora, New York. This handicraft community was founded in 1895 under the guidance and leadership of Elbert Hubbard, a writer and entrepreneur. The community was part of the Arts and Crafts movement whose goal was to create a self-contained and self-supporting community of people who produced artistic products. The Roycroft Shops had its heyday before 1915 with over 400 Roycrofters living and working in the community before finally closing in 1938. Elbert Hubbard, born in Bloomington, Illinois, June 19, 1856, started his adult life selling soap for the Chicago firm of Larkin and Weller. When Larkin established his own business in Buffalo, New York, Hubbard joined him to supervise sales and advertising. Although the business became phenomenally successful, Hubbard resigned in 1893 in order to study writing at Harvard. While still working for the Larkin Company, he had already written two books published in 1891 and 1892. At this same time, Hubbard’s personal life became complicated when his affair with Alice Moore, a school teacher, became public. Eventually he divorced his wife, Bertha, in 1903 and married Alice in 1904. Both wives were working partners with Hubbard in the enterprise that became the Roycroft Shops. Hubbard abandoned his Harvard plans but remained convinced he should become a writer. Inspired by a visit to William Morris’s Kelmscott Press in England in 1894 and armed with a settlement of $65,000 received when he left the Larkin Company, he established the Roycrofters Press with a partner in 1895. (The Roycrofters Press is also known as “The Roycrofters” or “The Roycroft Shops.”) The first item published was the periodical, The Philistine, which ran until 1915. In addition, Hubbard began to have his own books published through other publishers in 1894, starting his series of successful “little journey” works profiling the homes of famous people. The first book published by the Roycrofters Press was The Song of Songs in 1896. Hubbard supposedly named the press and developed its orb-and-cross logo although his associate, Harry P. Taber, may have been the actual creator. Hubbard attracted talented printers and graphic artists to work at the community, of which the best-known was the designer Dard Hunter. They began to turn out limited editions of books printed on expensive papers or even genuine animal vellum. Bindings were available in a variety of formats including suede over cardboard and leather which was stamped, modeled or tooled. Hubbard also used color for hand-decorated initials and illuminations. Of particular interest to Hubbard was the design of title pages which were created in a variety of heterogeneous styles by the artists who worked for the Press. The Roycrofters Press prices were broad ranging from $2.00 to over $100.00 for a single book. The Press also published a magazine called The Fra and after Hubbard’s death, continued with several magazines entitled Roycroft and Roycrofter. Ephemeral material such as booklists, catalogs, mottoes suitable for framing, and pamphlets were also published by the Roycrofters Press. Scholars have pointed out that Hubbard was a promoter who sold his books as handmade when, in fact, many were bound by a nearby Buffalo printer especially during the early years of the press. Several have remarked that the inks were occasionally out of register and that some of the signed editions had actually been signed by his assistants. The limited editions routinely exceeded the number Hubbard claimed. However, consistency and quality improved in the later years as more artists and printer specialists were attracted to the Roycrofters Press. In addition to establishing a printing press and doing bookbinding at the Roycroft Shops, Hubbard build a fourteen-building complex which housed workers and visitors as well as provided space for artistic endeavors. Artists worked in studios which produced pottery, furniture, metal-work, stained glass and leather-goods. Painters, sculptors and photographers also found their way to the Roycroft Shops. Hubbard established lectures, concerts and presentations by creative intellectuals who provided musical events, dances, exhibitions, and lectures for the community. To finance the community, Hubbard wrote ad copy for national advertisers and lectured widely, often on vaudeville stages, about his philosophies of work and living. He was famous enough that his death was reported in the New York Times along with those of other well-known passengers who drowned after the Lusitania sank. The Roycroft Inn, built to house the many visitors to East Aurora, is now a National Historic Landmark while the Roycroft campus is a tourist destination, hosting many events including Elderhostels. Several Roycroft books in the Luther College Special Collections should be noted. As mentioned above, the collection contains a number of the “little journey” books written by Hubbard. The Book of the Roycrofters (1907) includes a utopian description of the Roycroft community in East Aurora, New York, by Francis and Abigail Farrar. In An American Bible, edited by Alice Hubbard in 1911, quotations by famous Americans such as Thomas Jefferson and Ralph Waldo Emerson are included along with those of Elbert Hubbard. An essay by Alice Hubbard profiling her husband as, “the most positive human force of his time, a man of genius in business, in art, in literature, in philosophy” is part of the book. A memorial edition of Little Journeys to the Homes of the Great, published in 1916 after Hubbard’s death, includes a short autobiography in which Hubbard explains his philosophy for the Roycroft Shop. All of these books can be found by searching on the title phrase “Roycroft Collection” in WorldCat Discovery. 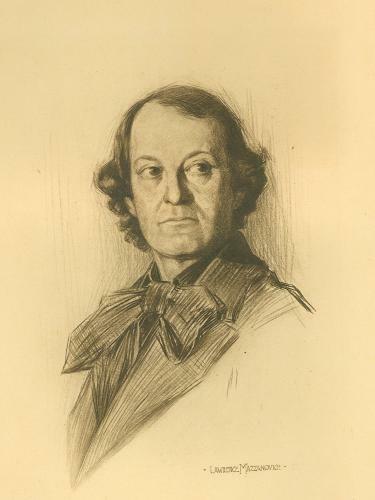 Ref: http://www.roycrofter.com/ (“The Webpage of the Roycrofters”); “Elbert Hubbard,” Dictionary of Literary Biography, American Magazine Journalists, 1900-1960. Vol. 91. Detroit: The Gale Group, 1990; Head, Heart and Hand: Elbert Hubbard and the Roycrofters. eds. Maria Via and Marjorie Searl. Rochester, NY: University of Rochester Press, 1994; “Many New Yorkers Sailed on Lusitania.” New York Times, May 8, 1915, p. 5.